Words by Sarah Lim, photos by ladyironchef. Open Door Policy at the uber-hip Yong Siak Street has certainly managed to draw in the brunch-loving crowd with their creative weekend offerings. Groups of patrons, mostly expatriate families, started streaming in once doors flung open at 11am and half an hour later the restaurant was fully packed. Being under the Spa Esprit group (which also manages Forty Hands Cafe), we’d expected no less of the décor, and ODP certainly delivers as far as ambience is concerned. Despite the collision of rustic wooden shelves, metallic elements lining the ceiling and stools looking as if they came out from a 1960s classroom, everything blended together to create the perfect Manhattan-chic vibe for a weekend brunch. And that was precisely what we were here for on a Sunday morning. 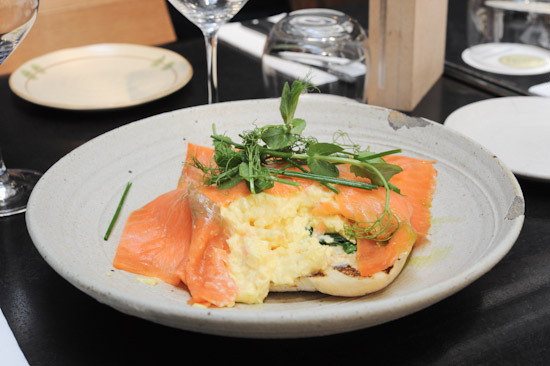 It didn’t matter that the brunch menu had fewer than 10 items; we immediately homed in on the pancakes, French toast and smoked salmon with scrambled eggs. If you thought the decoration was stunning, prepared to be awed by the beauty (literally) of the dishes. Our almost too-pretty-to-eat French toast with roasted berries and vanilla ice cream ($18+) was a testament to the emphasis ODP places on food presentation. Four hunky blocks of buttery, almost cake-like brioche perfectly seared to achieve a crusty caramelized surface came dusted with icing sugar. The juicy compote of berries and creamy vanilla ice were the perfect accompaniment to the French toast. The marriage of flavours and textures was indeed a treat for the palate. The smoked salmon and scrambled eggs on toasted ciabatta with spinach and fresh herbs ($19+) was a less exciting option. Parting the slices of smoked salmon that blanketed the dish revealed a generous portion of gorgeously creamy scrambled eggs, which we felt could have been perfect with a little more seasoning. Having been soaked through by the moist eggs, the ciabatta was also less crusty than we’d have hoped for. Amongst the three dishes, we were least impressed by the ODP pancakes with black berry and chocolate ($17+). These turned out too thick and dry for us since we’ve been so spoilt by fluffier varieties elsewhere, and were struggling to finish despite sharing. Fortunately, the sticky and decadent chocolate sauce, balanced by the tart blackberries was a welcomed redemption for the dish. Service was efficient despite running on full house, so applaud ODP for doing away with the 10% service charge despite their right to do so. While prices here still push the boundaries for brunch, what you get in exchange is a wonderful dining experience amidst beautiful surroundings – as long as you pick the right dishes. Mmm the French Toast looks good! I like ODP’s seabass and salmon.